Lebanon Attorney Corey Lamoureux, of the law firm of Reilly Wolfson, recently received the Pennsylvania Bar Association’s William H. G. Warner Pro Bono Attorney of the Year during a meeting of the Lebanon County Bar Association. The annual award, named for the late William H.G. Warner, Esq., recognizes an attorney who is committed to providing legal services to the public and to helping to make Pro Bono legal service what it is today in Lebanon County. In Lebanon County, about 60 local attorneys annually provide Pro Bono service to more than 300 clients in support of MidPenn Legal Services, in the following types of cases: Custody, Divorce, Unemployment Compensation, Bankruptcy, Child Support, and Protection from Abuse. 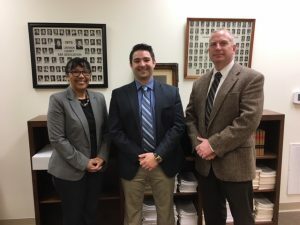 Pictured from left are: MidPenn Legal Services Executive Director Rhodia Thomas, Lebanon Attorney Corey Lamoureux, winner of the 2018 Pennsylvania Bar Association’s William H. G. Warner Pro Bono Attorney of the Year Award and MidPenn Legal Services Managing Attorney Nick Matash.